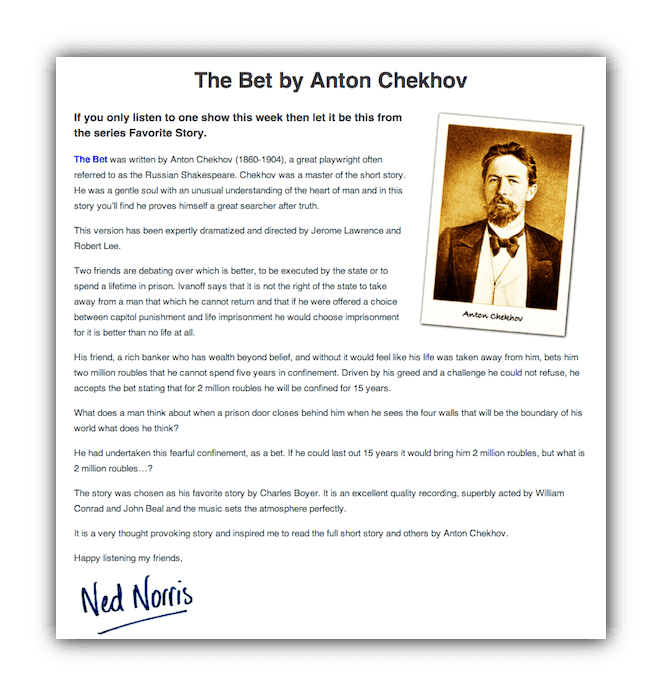 "the best OTR site on the Web"
Hi, it's Ned Norris here. 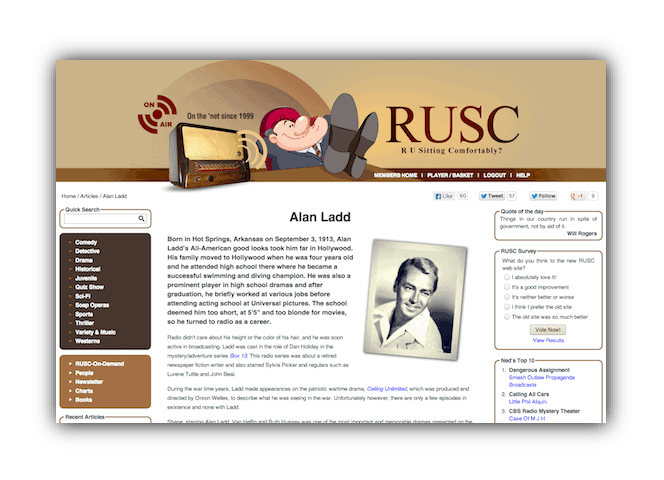 I'm going to take you on a virtual tour of the Members' Area of RUSC so that you'll see first-hand how easy it is to begin using RUSC to enjoy all the old-time-radio shows you want. Here is a screen shot of the member's home page. On the left is a list of the major old-time-radio categories such as Comedy, Detective, Drama, etc. On the right is Ned's Top 10 of old-time-radio shows. This is an ever-changing list of the shows that have been downloaded most frequently over the past month. There are also charts for each of the major categories. It's a good way of finding out what shows other members are enjoying so that you might enjoy them, too. On the home page you'll also find the latest editorial. This will usually be something about an old time radio series, a particular show, or it might focus on one of the stars of the day. Other times it might be about a new feature on the site, an old time radio themed crossword puzzle, or anything else that we feel might entertain you. When you click on a category from the selection on the left hand side of any of the pages in the member's area, you get a list of all the series in that particular category. 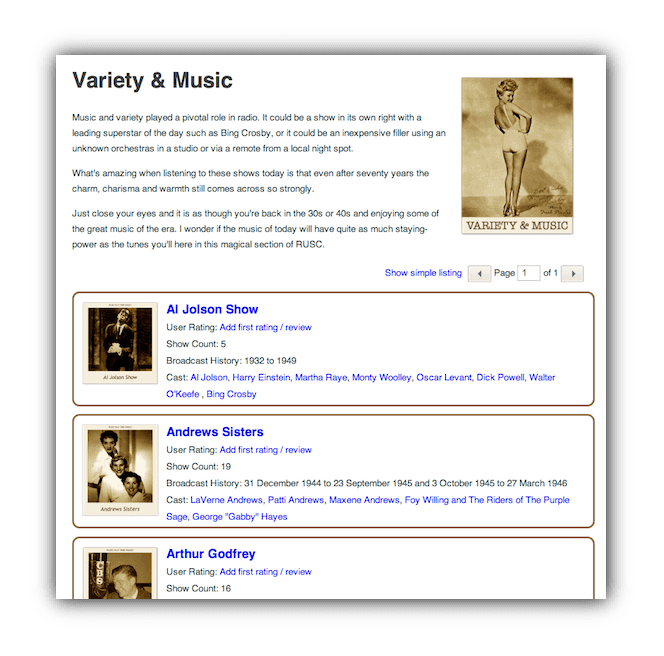 Here's an example of the page that will appear when you click on one of the categories. 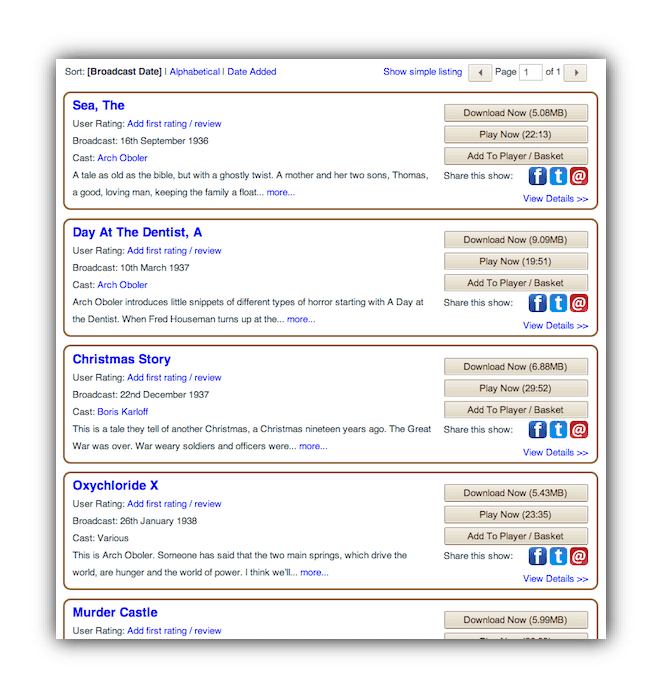 You can browse the list at your leisure and click on the radio series of your choice. If you want to find out more about any particular series you can click on the appropriate link and you'll arrive at a page that provides you with more detail. Sometimes it is just a brief overview, other times it is a mini essay including information such as when the show was first broadcast and when the final broadcast was aired, who sponsored it, the cast members and announcers, writers, theme tune and a potted-history of the show. 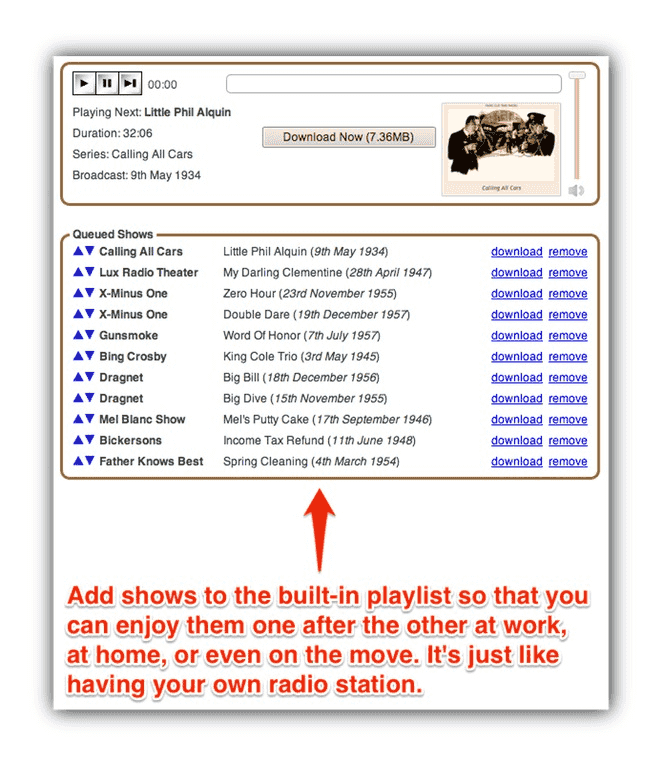 This information can be a useful background resource and makes listening to these wonderful shows even more pleasurable. Below the detailed information about the series you'll find a list of the shows in that series. You can view this as either a detailed listing or as a simple listing and you can sort by broadcast date, alphabetical order, or the date the shows were added to RUSC. From here you can download the shows to your computer, add them to your basket to download later, start them playing immediately or add them to your playlist. The choice is up to you. 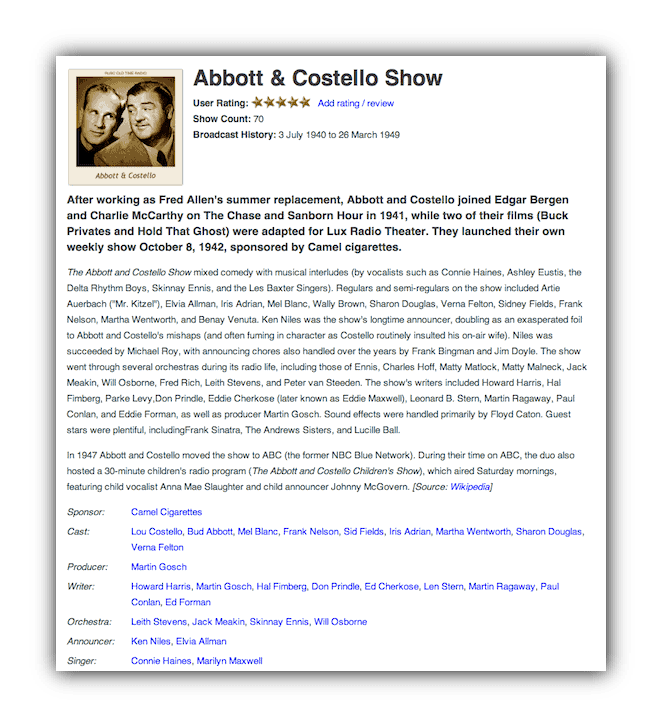 On the Show Details page you get all sorts of useful information such as the star of the show, length in minutes and seconds, size of the file, the date the show was originally broadcast and a brief review of the show itself. There are also links to find out more about the star of the show or the series itself if you wish. To download the show to your computer you just need to click on one of the links on the left of the page; Add to Basket or Right Click here to Download. I'll tell you a little more about downloading in a minute. When you've decide which shows you want to download you have two options. Click on either the Add to Basket button or the Right click here to download button. 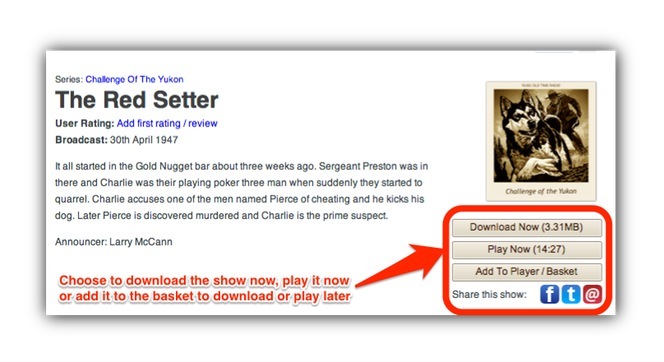 The Right Click here to Download button lets you download any show immediately. Simply add any shows to your basket/playlist. 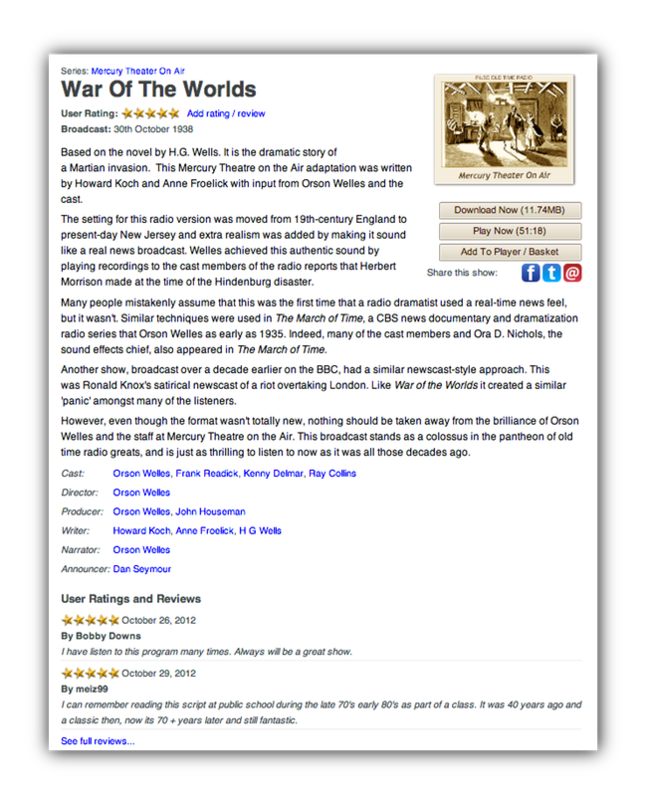 From there you can download the shows at the click of a button or listen to them at your leisure. The basket/playlist will play the shows one after another so you can queue up as many shows as you like and enjoy them for hours on end. It is just like having your own radio station where you choose what is being broadcast. As you can see there is nothing complicated about the RUSC Member's site. It's been designed so that people who weren't brought up computers (that includes me) can you use it. It allows you to start enjoying the thousands of shows that are available immediately -- rather than getting bogged down with technical details.